BrewerBOND® 220 temporary wafer bonding material is an organic coating that enables back-end-of-line (BEOL) processing of ultrathin wafers using standard semiconductor equipment. This product improves throughput, simplifies cleaning, and shortens processing time. For coatings thicker than 20 µm, BrewerBOND® 220 material is a good option as an alternative solution to typical wax adhesives. It offers significant advantages because it can be applied with a one-coat process. The material provides up to a 160-μm film with a single coat and customized spin process. BrewerBOND® 220 material enables backside temperature processing up to 250°C with minimal device wafer bowing. BrewerBOND® 220 material does not introduce additional stress in the bonded stack. 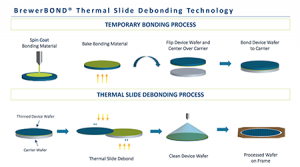 This versatile material can be used for the thermal slide or mechanical debonding methods.